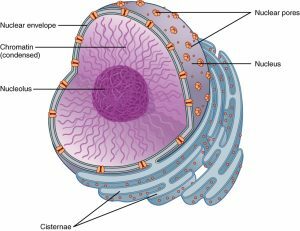 Every eukaryotic cell contains a nucleus. This article will discuss the structure and contents of the nucleus. Gene expression – the nucleus houses the cell’s genomic DNA wrapped around histone proteins to form a structure called chromatin. This allows it to fit in the nucleus and protects it from damage. The DNA is used to control gene expression through a process called transcription, where a DNA template is used to produce pre-mRNA. This requires enzymes such as helicase which are also present in the nucleus. 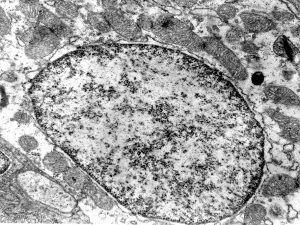 Compartmentalisation – a double membrane encloses the nucleus, protecting its DNA from the cytosolic environment, while perforations called nuclear pores allow passage of ions and small molecules. In addition, the nucleus contains a nucleolus within it, which is the primary site for ribosome synthesis. Fig 1 – Nucleus with the cisternae of a continuous endoplasmic reticulum highlighting its main features. When the nucleus is observed through an electron microscope we can see areas of light and dark. Both of these areas are chromatin. The light areas are known as euchromatin. This is a more loosely packed chromatin which is normally under active transcription. The darker areas are heterochromatin. This is a tightly packed chromatin that is not being transcribed. Which structure houses the cell's DNA? Newly formed mRNA must undergo which process in order to become mature mRNA? What is the area with loosely packed chromatin under active transcription known as?